The workplace is a meeting point: one of the major shared spaces of LGBTQI people and heterosexual / cisgender people. Between June 2015 and July 2016, Háttér Society conducted a new research project entitled ‘Stories beyond the data: Documentation of discrimination in the field of employment’ with the support of ILGA-Europe within its Documentation and Advocacy Fund. The objective of the project was to supplement the existing (mostly quantitative) data with the results of new, primarily qualitative research. The purpose of conducting this research was twofold. 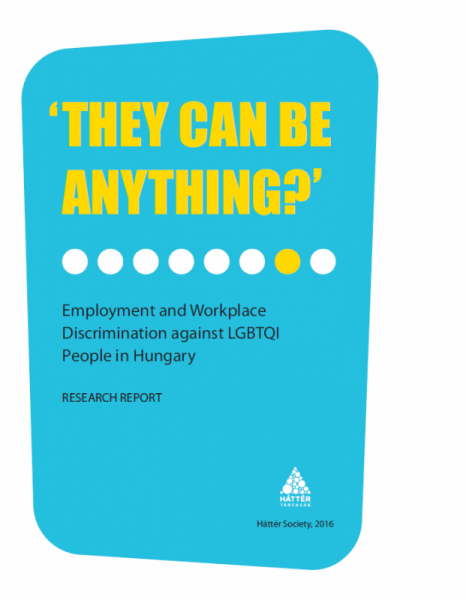 First, the researchers wanted to map problems with regards to the employment discrimination of LGBTI people; that is, to reveal the mistreatment of a group of people in an environment that takes up a significant proportion of the life of adult Hungarians on the one hand. Second, the researchers wanted to map solutions; that is, to expose how workplaces can be inclusive, treating LGBTQI people as fully equal members of society. The key objective of the research is to form the basis of future projects aimed at eliminating the employment discrimination of LGBTQI people. Chapter 2 reviews earlier research results, and Chapter 3 describes the methodology and main results of the present research. Chapter 4 is about our respondents’ career choices. Chapter 5 describes two workplaces that are characterized by especially prevalent heteronormativity: schools and the police. Chapter 6 discusses transgender employees and the specific problems they face, as well as questions related to gender expression. Chapter 7 reviews interviews conducted with colleagues of LGBTQI people. Chapter 8 analyzes the results of an online survey we conducted with HR personnel, reflecting respondents’ attitudes and legal awareness. Chapters 9 through 12 provide legal background on LGBTQI workplace discrimination, recommendations for eliminating LGBTQI workplace discrimination, sample equal opportunities programs, and best practices. At the end of the research report, we explain a few expressions often used in the report and share a list of references.